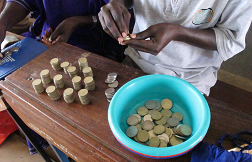 This form of microfinance is most effective in rural areas, where demand for credit is low and delivery costs are high. Giving people access to savings plans reduces risk of debt and can be managed locally. Village Savings and Loan Associations are a great example, because local groups are trained to manage their own investment pools which then provide savings, insurance, and credit to members. This allows members to provide financial services for one another, and improve the overall quality of life. In India, many poor people don’t have access to savings accounts because bank branches are not located in rural areas, and their deposit amounts are too small. Basix Sub-K Transactions is pioneering a new savings system, allowing supermarkets and convenience stores to offer savings services. Sub-K refers to transactions fewer than 1000 rupees (about USD 20) and their goal is that it also means a Sub-K branch in less than 1 kilometer of any customer. Using mobile phones, customers set up a voice recognition password and can begin put money in their savings account. An alternative banking solution, offering free savings accounts and limited financial services in community post offices. This gives everyone free access to banking services, however the time and travel required to access money is a deterrent for some.